Empires Comics Vault: Two Cans For Local Comics Discount, Benefitting Senior Services Inc.
Two Cans For Local Comics Discount, Benefitting Senior Services Inc. This Saturday, November 10 there will be a canned food drive at the shop. Bring in two cans (or more!) 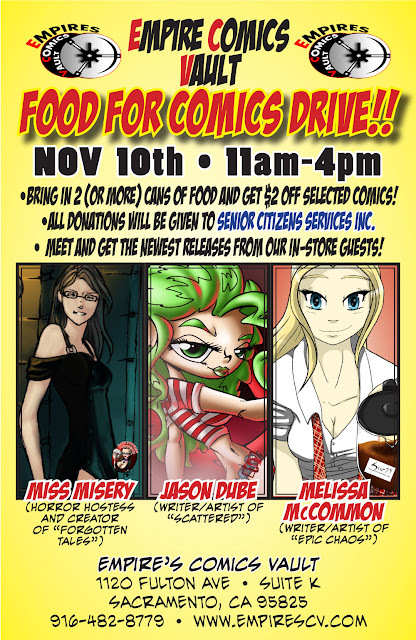 of food and you'll receive $2 off select local comics. You'll also be helping Sacramento's senior citizens. Also, Empire's Comics Vault will match every can you bring in, can-for-can! That matching will take place for every can that comes in between now and Saturday. Of course, if you can't come in on Saturday, you're welcome to drop off the canned food before or after Saturday.